Conservatives have long had Roe v. Wade—the 1973 landmark U.S. Supreme Court decision that established the constitutional right to access abortion—in the crosshairs, and Kavanaugh’s nomination has raised their hopes. If Roe is overturned, U.S. women will certainly suffer. And women of color stand to lose the most. Before Roe, middle-class white women led the charge to help fellow white women access abortion. For years before abortion was legal, groups such as the Jane Collective formed as secret societies, organizing around abortion rights and helping women attain abortions from trained providers. Black women had abortions—largely unsafe—before Roe too. Unlike white women, however, black women were largely invisible to mainstream groups organizing around abortion access and rights. Reasons for this include black women’s lack of financial resources and social connections to abortion providers, as well as the stigma around abortion in the black community at the time. A recent story about the Jane Collective noted how a young black woman named Lois came to the group for an abortion. After calling out the organization for not reaching out to black women, Lois started working with the Jane Collective to counsel other black women. Building on Lois’ efforts many years ago, women of color-led organizations such as In Our Own Voice: National Black Women’s Reproductive Justice Agenda, the National Asian Pacific American Women’s Forum, and the National Latina Institute for Reproductive Health have given voice to the struggle for reproductive freedom. Despite the gains made since the legalization of abortion, the promise of Roe v. Wade has not been fully realized for many women of color. 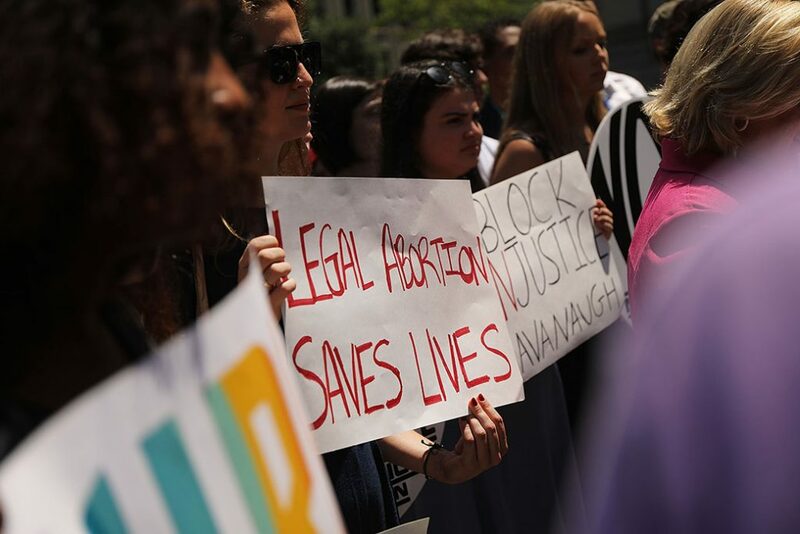 A rising wave of restrictive abortion laws is affecting women across the country, and women of color are more likely to live in states with the most restrictive abortion laws. Women of color are also more likely to experience barriers to abortion and other reproductive and maternal health services, including contraception, maternity care, and screenings for reproductive cancers. In almost every aspect of reproductive health, women of color have poorer health outcomes than white women. Black women are dying at three to four times the rate of white women due to pregnancy-related issues. Both black women and Latinas experience higher rates of unintended pregnancy than their white counterparts. And cultural issues, stereotypes, and fear can cause Asian American and Pacific Islander women to forgo reproductive health care. These communities of women of color are also more likely to have limited access to safe and legal abortion. Abortion can be cost-prohibitive for any woman who lacks insurance coverage for the procedure or the financial wherewithal to pay out of pocket. Unfortunately, women of color are most likely to lack both these things. Women of color are also most likely to experience racism and discrimination within the U.S. health care system. With 67 million women experiencing pre-existing health conditions, striking down the Affordable Care Act’s consumer protections, along with overturning Roe v. Wade, will compound the harmful impacts on women of color at risk for poor reproductive health outcomes. Moreover, it’s important to consider how women of color would suffer if antagonistic legal rulings were combined with the Trump administration’s and Congress’ changes to policies that affect reproductive health and rights. The list of policies under attack is long and includes eviscerating Medicaid; chipping away at comprehensive, evidence-based family planning supported by the Title X program; stripping funding for key entitlement programs that have historically supported women and families in need; and appointing anti-choice executive branch officials, as well as ongoing efforts to repeal and undermine the Affordable Care Act, among so many others. President Trump has made it abundantly clear that he will only appoint justices to the Supreme Court who are hostile to abortion—even going so far as to say that women should be punished for choosing to terminate a pregnancy. He has certainly delivered on this promise with the nomination of Kavanaugh, an extreme conservative whose record on the federal bench, in previous administrations, and in legal writings makes clear that he would put his own ideology ahead of women’s constitutional right to access abortion. If Kavanaugh is confirmed, the stakes are highest for women of color due to the distinct barriers in access to reproductive health care, the vast health disparities, the fact that many live in states with the strictest abortion laws, and the racial and gender discrimination present in the U.S. health care system. Historically, the voices of women of color have been excluded from the dialogue and activism around reproductive rights. This time around, those voices must be integral to the dialogue around Kavanaugh’s nomination and the threat to health care access. Diverse voices and perspectives that uplift an intersectional, reproductive justice approach are needed now more than ever. Jamila Taylor is a senior fellow at the Center for American Progress.